The UN-approved Government of National Accord in Libya (Tripoli) under Fayez al-Serraj (pictured below with the Italian PM), which does not control the eastern part of the country currently under the leadership of General Khalifar Hafta (mentioned at length in the report below), formally asked Italian Prime Minister Paolo Gentiloni at the end of last month to send naval support into Libyan territorial waters – starting at the end of August – so as to combat the refugee problem and stop the massive influx into Italy. This according to a report in The Libyan Express. Another report, however, suggests that there is indeed some contention over the proposed measure within the governing council under al-Serraj, while yet another report in Malta Today claims that al-Serraj has denied asking for direct Italian intervention and that Libyan sovereignty is a red line for his government. The report by Alex Lantier below makes it appear that Italy is unilaterally interfering in, and violating, the sovereignty of Libya. Whether the Italian action of sending a warship into Libyan waters is indeed a violation or not remains unclear at this point, although not to Haftar who certainly does view it as such. What seems to be clear is that Italy is gung-ho to prevent a greater influx of migrants from Libya, and that the Libyan government under al-Serraj is highly sensitive to charges at home that it is surrendering national sovereignty to former colonial power, Italy. 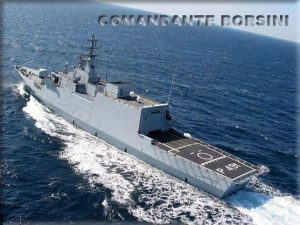 On August 3, the Italian government sent the frigate Commandante Borsini into Libyan territorial waters to stop refugees fleeing Libya for Europe. This violation of the sovereignty of Libya, a former Italian colony, aims to destroy refugee vessels and force refugees back into Libya, where the militias that have controlled the country ever since the devastating NATO war against Libya in 2011 detain them in appalling conditions. The law provoked outrage on Libyan social media and protests in the Libyan capital, Tripoli, with banners bearing pictures of Omar al-Mukhtar, the “Lion of the Desert”, who led the resistance to Italian colonial rule in the early 20th century, and the slogan “No to a return to colonialism.” Rome reacted by cutting the number of vessels deployed off Libya from six to two. Human rights groups denounced the Italian naval operation. 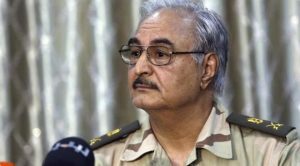 The Italian operation provoked a loud condemnation from Field Marshal Khalifa Haftar (pictured), a former Libyan general and CIA asset who now controls much of eastern Libya around Benghazi and is being groomed as a proxy for French imperialism. 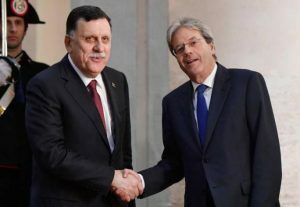 Haftar’s Libyan National Army (LNA) declared in a communiqué that it would “confront any naval vessel that enters national waters without permission from the army.” It called the Italian operation a “violation of sovereignty” of Libya by Italy which was aiming to “export the illegal immigration crisis from its territory to Libya’s.” The LNA claimed that its forces in Benghazi, Tobruk, and Ras Lanouf, in the eastern part of Libya, as well as in Tripoli in the west, would confront Italian vessels. It is plainly evident that Haftar, like the other militia leaders in Libya, is hostile to the anti-imperialist sentiment that is rising among the Libyan workers and masses. He is not fundamentally different from the militias in Misrata and elsewhere in western Libya currently working with Rome. He plans to use the LNA’s control of eastern Libya’s vast petroleum reserves and of the Ras Lanouf refineries to develop ties with other imperialist powers, including France, as well as with the Russian, Algerian, and Egyptian regimes. He indicated that Washington planned to continue working with the Tripoli regime.